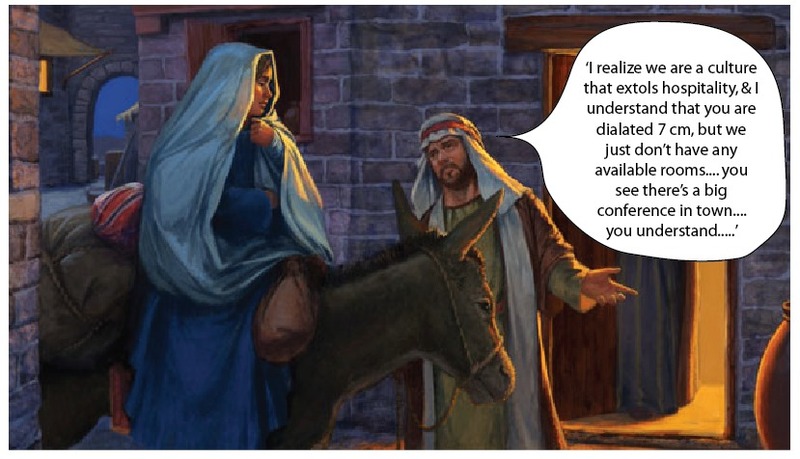 In which gospel does the innkeeper tell Mary and Joseph that he has no rooms available for them? Trick question; Luke simply writes that Jesus was laid in a manger because there was no room for them in the inn. No innkeeper is ever mentioned. But what if there wasn’t even an inn? Kenneth E. Bailey, in Jesus Through Middle Eastern Eyes: Cultural Studies in the Gospels, makes a convincing case that the inn mentioned in most translations was in fact the guest room of a typical peasant home, and that Jesus was in fact born surrounded by relatives of Joseph and perhaps even Mary. Wealthy homes had separate buildings for animals, but the typical peasant village home would be a simple two-room house, one room being reserved for guests. Animals would be brought in at night to prevent theft and protect them from the cold. The areas where the animals would be kept would be a few feet lower than the main room, and there would be mangers along one of the walls. The word translated as “inn” in Luke 2, katalyma, simply means “place to stay,” but the word for “inn” typically would be pandocheion, which is the word Luke uses in the parable of the Good Samaritan. In chapter 22 Luke uses katalyma to refer to the guest room where Jesus and the disciples observed Passover and where Jesus instituted the Lord’s Supper. Bethlehem was Joseph’s ancestral hometown, and Middle Eastern hospitality was such that even if there weren’t any family members left in the village, the village residents would have insisted on housing him and his family, especially with a pregnant wife. To summarize, a part of what Luke tells us about the birth of Jesus is that the holy family traveled to Bethlehem, where they were received into a private home. The child was born, wrapped and (literally) “put to bed” (anaklino) in the living room in the manger that was either built into the floor or made of wood and moved into the family living space. Why weren’t they invited into the family guest room, the reader might naturally ask? The answer is that the guest room was already occupied by other guests. The host family graciously accepted Mary and Joseph into the family room of their house. Kenneth E. Bailey. Jesus Through Middle Eastern Eyes: Cultural Studies in the Gospels (Kindle Locations 317-321). Kindle Edition. This is in keeping with the rest of Luke’s narrative, in which the common peasant, the poor, the weak, the disenfranchised, the outcast, and the unclean all receive Jesus gladly even as he gladly welcomes them into his presence and his kingdom. Thus the significance of the shepherd’s visit. Shepherds were lowly, uneducated men considered unclean by the rabbis, at the bottom of the social scale in Israelite society. Yet it is to them that an angel appears and invites them to go visit the newborn messiah. When the angel tells them that they will find him lying in a manger, they immediately realize that he is not in a palace where they would be immediately dismissed, but in a common peasant home where they would be welcomed. This was the “sign” mentioned by the angel. The manger was the sign that they would be welcomed, which they were. And when they went away praising God, it wasn’t just because the messiah had been born, but also because they had been invited and welcomed into his presence. They were outsiders no more. This new way of understanding the circumstances of Jesus’ birth is in keeping with the rest of Luke’s narrative. We no longer need to posit a story of universal rejection of Jesus, received only by ox and lamb. Though he wasn’t received by the likes of Herod or the Temple leadership, this little peasant baby was received by peasant friends and relatives. He became their champion, and that of any who receive him. For a Bible limerick related to the Magnificat, go here.